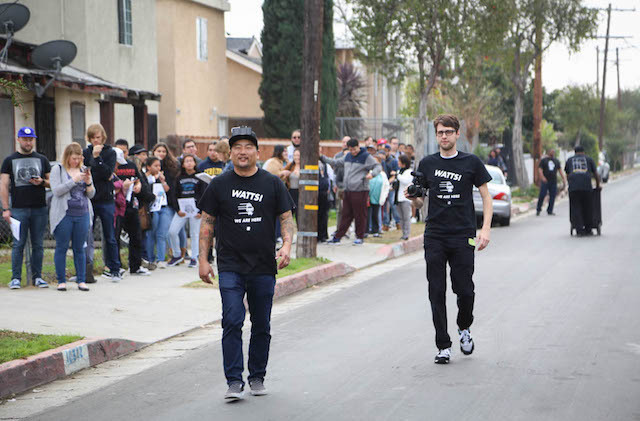 Hundreds lined up in Watts today, with a queue wrapping around the block for the grand opening of chefs Roy Choi and Daniel Patterson&apos;s first healthful fast-food chain, LocoL. The community&apos;s energy and excitement about the restaurant opening was contagious. A DJ spun hip hop and R&B music that blasted on speakers outside, and people of all ages waited patiently in line—some of them waiting since 7 a.m.—to get a first taste of the food. 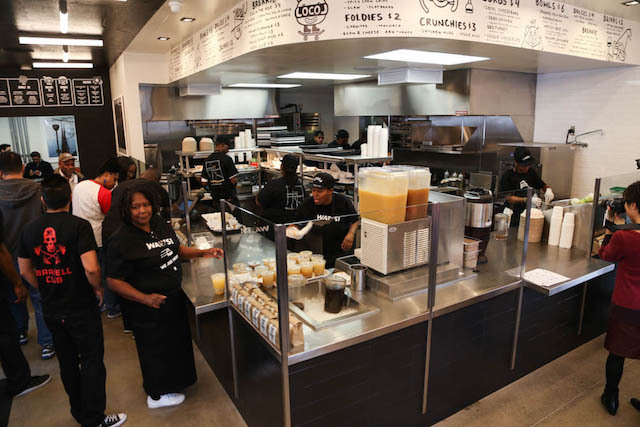 Right at 11 a.m. when LocoL opened its doors, they played Martin Luther King, Jr&apos;s. "I Have a Dream" speech in commemoration of MLK Day, as some stood in silence and others clapped in agreement. As kids waited in line, LocoL employees passed out juice, water and snacks to them. Others stood in line wearing "I Love Watts" t-shirts. Choi helped shout out pick-up order numbers to the new customers. 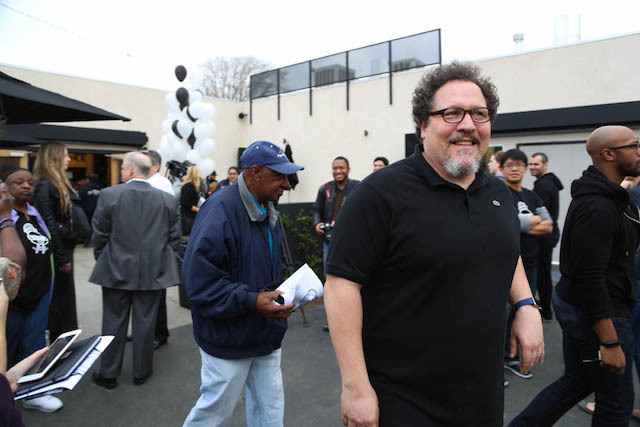 The event even brought out some big names, like Jon Favreau, Lena Dunham, Jim Brown and Mayor Eric Garcetti. The grand opening was a momentous occasion for a number of reasons. 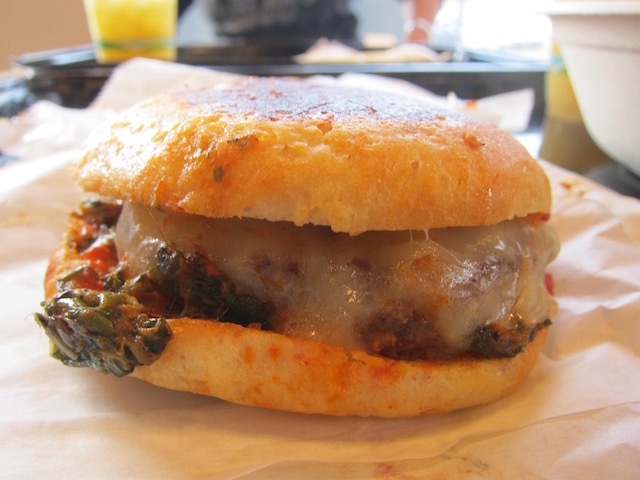 LocoL brings about healthful fast food options to an otherwise food desert in Watts, where most of the options tend to be greasy fast food from the likes of Burger King. Choi said at the event that everything at LocoL is made from scratch and they never use frozen food. Their fast food also comes at a reasonable price range, from $1 to $6. As for the community aspect of LocoL, they hire employees from Watts as well. "This is history in the making, I believe," Choi said. A number of kids surrounded Choi throughout the grand opening, excited to meet him and calling out his name. He explained how he wanted to also make an impact on these children&apos;s lives. "If this becomes successful, this experience will be a memory for these kids where they can take it with them in their lives." Patterson told LAist that they were mostly there to "feed people" and "get people jobs," but he also talked about how it brought people out from other parts of L.A. to Watts, too. "People are wonderful, genuine and loving here. Maybe people will come back, open more businesses here. Makes it a positive experience when there’s a humanizing effect," Patterson said. Garcetti also talked about bringing people into the community as well. He asked the crowd if anyone had been to Watts before or at least in the last year, and welcomed them to "one of the most incredible communities anywhere." "This is the heart of L.A., and 50 years after the Watts uprising we&apos;re here, just a few months ago saying, &apos;We wouldn&apos;t just commemorate history, we&apos;d make history,&apos;" Garcetti said. "Now we&apos;ve got LocoL, Children&apos;s Institute working with Frank Gehry to come in here. 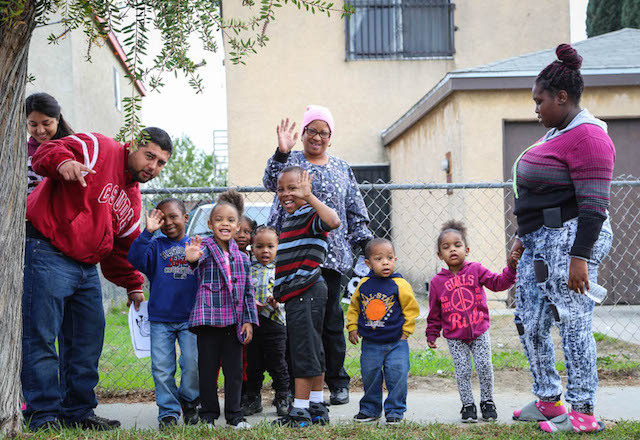 We&apos;ve got the best of what&apos;s here and partners and friends coming from outside saying, &apos;Watts matters.&apos; And a half century after that uprising, we got to make sure that the next generation has jobs, has a future, has dreams, and they can realize them not outside of Watts, but here at home in Watts." Community members echoed the same sentiment. Tisha Reed, who had been waiting in line since 8:30 a.m., told LAist that was she was there for MLK Day. "The opening of the restaurant is one piece of the puzzle in a tribute for him," Reed said. "It&apos;s a great area for the business because of the lack of employment here. For the community, with the presence of togetherness, it can bring hope and our community can stand together and become as one." She added that LocoL gave them options to eat healthier, and different styles of cooking with fresh ingredients instead of fried, greasy food. "There&apos;s nothing here but Burger King and stuff like that. It&apos;s been like that for years. It&apos;s a good thing for [Choi] to want to bring food here. It&apos;s a blessing." Susana Moreno, who was the 13th person in line, lives just a couple of blocks away and has been watching the whole progress of the restaurant being built over the past year. "I&apos;ve noticed a change," she told LAist. "We don&apos;t have anything that looks nice. They&apos;re keeping their promise to bring us a healthy alternative, which we don&apos;t have much [of around] here." Inside LocoL, you can find cheery black and white cartoons decorating the walls, block-style tables and chairs, and a "We Are Here!!" sign emblazoned at the entrance. Huge windows look out to the back patio, where there are more tables and umbrellas for people to sit at and eat. As for the menu itself, they have $4 "Burgs," including a fried chicken sandwich, cheeseburgers with scallion relish and veggie burger options. There are $6 bowls with noodles made with ginger, chile and lime, veggie and tofu stews, and beef chili bowls. You can get "Foldies," that are like taco-quesadilla hybrids made with carnitas, bean and cheese and machaca. They even have breakfast items, $1 agua frescas and coffee (no sodas in this place! ), and $4 soft-serve sundaes. As for the future of LocoL, expect many more locations to open soon. Choi says they&apos;re expanding next to Oakland, then the Tenderloin in San Francisco, and Watts again off of Central Avenue. "This is L.A," Choi said. "Let’s get past racial segregation. Let’s get together."